The Premium Edition is one of two cloud-hosted annual subscription options (the other is the Standard Edition) that contain the LabLynx webLIMS application along with sciCloud.net®, LIMSforum.com and the other available options, along with an included Service Plan. Select this package to meet your needs if a concurrent-user subscription makes the most sense for you. If you have, say, ten lab staff but realistically only maybe four would be logged in and using the system at a time, then it would be cheaper and make more sense to select the Premium Edition 4-concurrent user subscription than a 10-named user Standard Edition subscription. However, if you must host onsite, for instance, or you prefer a one-time fee perpetual license with separate Service Plan, then the Enterprise Edition would be the correct choice. Any Integrations, e.g. to other systems/databases, instruments, services etc. 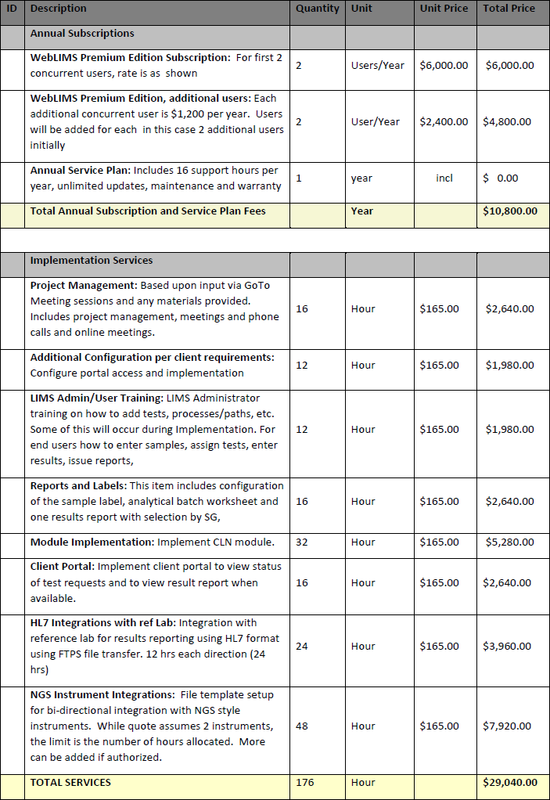 Note that the Service Plan is Included in annual subscription (Includes 8 annual Support Hours). This edition is most often compared with the Standard Edition option, so take a look at that to get an idea of which might work best for you – or either of the other editions. If you were to get a 10-named user subscription using the Standard Edition option, you would end up paying more, because 2 users are $3,000, plus 8 additional @ $1,200 each = $9,600, so your total annual subscription would be $3,000 + $9,600 = $12,600 – as opposed to $10,800 with four concurrent users in the Premium Edition. But to make sure you get the right solution package and edition, always talk to your LabLynx, Inc. representative. See the Company section of the LabLynx.com website for Contact Information.